Don’t we all love wearing footwear that’s new or matches our outfit everyday but think it’s not economical? Wiping these woes out is — Murtle — a Hyderabadi brand that makes modular footwear. Murtle is probably the world’s first modular footwear brand where people like you and me can swap and change the look and feel of the footwear within seconds. Yup, you heard that right and we don’t even need to understand the ABC of making footwear to do this. Shashank Pawar, a man of many interests and feathers in his hat, is the founder of Murtle and he started this project with an aim to create something unique as well as sustainable. After a couple of initial experiments where he crafted nearly 100 designs and variations, a final product was sketched and put up for crowdfunding which received a funding of over 198%. While the fear of falling short of delivering rewards made him pull down the campaign, he eventually set up a process where every element that goes into the making of footwear is handcrafted — dyeing to finishing. Plus, the brand has employed skilled artisans (paint artists from Chittoor and workers from Agra) whose art has been turning bygone because of automation technology. The fabrics that go into the making are sourced from Mangalagiri and Gujrat; the leather is from Chennai while the plastics are from Hyderabad. Whether you’re in the mood for synthetic fabric or leather or synthetic-based uppers, you can pick from the catalogue. Each pair comes with three soles and three changeable straps in different colours (and designs). Depending on your outfit, you can change the strap and nail that OOTD look on Instagram. 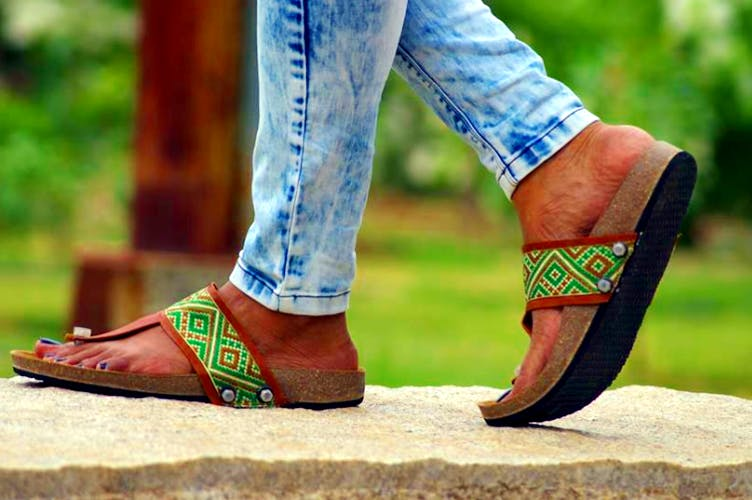 Although the brand has plain straps at the moment, they are in the process of making hand-embroidered, hand-painted footwear along with hand-woven fabrics. We are totes excited to own a pair of embroidered ones when they are out in the market. What about you? While in India, you can pick these sets at INR 1,999 and upwards from their website; also, it’s a part of Amazon Launchpad in the US where you can grab them at $69 and upwards.